I do love this scale. As all digital kitchen scales do, this scale can switch from imperial to metric units, has that all important zero button, and doesn't have a ridiculous basket to try to fit things in. But it also has an app. The app connects the scale to my iPhone via bluetooth such that when I weigh something on the scale, the app knows, and amazingly, using the app's built in database, I'm able to get a more precise number of calories for whatever item I'm measuring than my eyeballs could afford. The reviews on Amazon are few and are mixed. A couple speak to the lack of bluetooth connectivity for the Android app, but according to the comments on the app over at Google Play, this has been fixed. Another was upset that they couldn't find a particular brand of Trader Joe pasta in the database. And I guess that would upset me if I were eating a great deal from boxes and jars, but looking up base ingredients I've yet to come across one the scale didn't already have on hand. 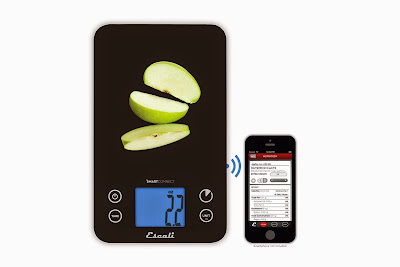 Ultimately this scale is for folks who are calorie conscious who tend to cook from fresh whole ingredients and want an easy and accurate way to account for what they're eating. If you're interested, at least yesterday, the scale was half price on Amazon at $49.99, and here's an Amazon Associates link to their sale page.